The elegance and clean contemporary design of the glass and black coated metal Gramercy model Anywhere Fireplace™ works anyplace, indoor or outdoor. 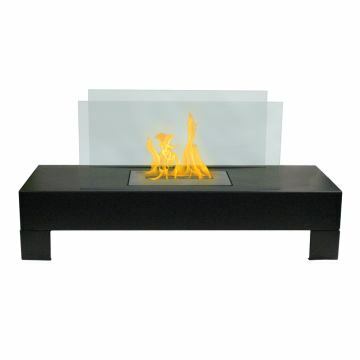 Just place in it on the floor on a table and add the ambiance of fire to any location. No installation necessary. The Gramercy is totally free standing and portable so you can move it from one location to another-anywhere you want to enjoy the warm glow of fire. This Gramecy Collection item features a video.